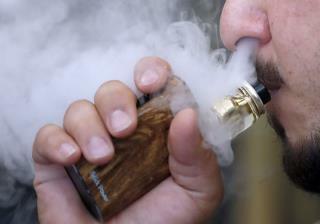 (Newser) – Youth vaping is an "epidemic," as far as the FDA is concerned, and if manufacturers don't submit "robust" plans to prevent kids from getting their hands on flavored e-cigarettes, the agency will take action—possibly going so far as to order the flavored products off the shelves. FDA Commissioner Scott Gottlieb announced the plan Wednesday, saying the agency is giving the manufacturers of Juul, Vuse, MarkTen, Blu, and Logic—which make up more than 97% of the US e-cigarette market—60 days to submit their plans, USA Today reports. The agency will then determine whether the plans go far enough. Inhaling anything into your lungs including pot is very harmful. If they are going to ban E-cigs then pot should be next. Cigarette manufacturers supposedly ramped up nicotine content in their products to more quickly addict the smoker. E-cigs have no tobacco or smoke. They are just another nicotine delivery device that will hook the user. Good luck kicking that habit. I don’t smoke. Never cared for it.